Sitges is a town about 35 kilometres southwest of Barcelona, in Catalonia, renowned worldwide for its Film Festival and Carnival. Located between the Garraf Massif and the sea, it is known for its beaches, nightspots, and historical sites.While the roots of Sitges' artsy reputation date back to the late 19th century, when Catalan painter Santiago Rusiñol took up residence there during the summer, the town became a centre for the 1960s counterculture in mainland Spain, then still under the dictatorship of Francisco Franco, and became known as "Ibiza in miniature".Nowadays, it is a popular destination for gay and lesbian travellers, as it has become one of the most gay-friendly places in the world.Today, Sitges' economy is based on tourism and culture offering more than 4,500 hotel beds, half of them in four-star hotels.Almost 35% of the approximately 26,000 permanent inhabitants are from the Netherlands, the UK, France and Scandinavia, whose children attend international schools in the area. There are 17 beaches. Sitges was also the site of the annual Bilderberg conference held in June 2010.Sitges has been referred to as the Saint-Tropez of Spain, with property prices approaching those of the most expensive European cities, the main reason for this being the setting by the sea and the surrounding Parc Natural del Garraf. Proximity to Barcelona-El Prat Airport is also a major advantage. 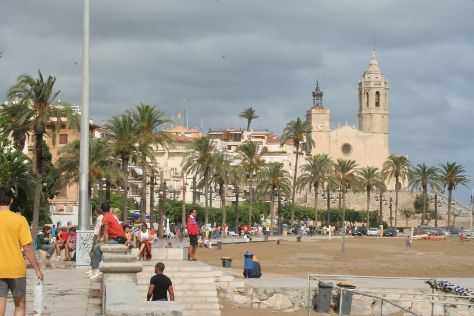 Sitges is in Province of Barcelona. Whether you only want to go to Sitges, or have a whole adventure planned, Inspirock has you covered with our user-friendly Spain road trip website .